Need to raise a sprinkler head? Don’t dig it! Kap-It! Snap-It! Lift-It! Raise-It! Sprinkler-It! 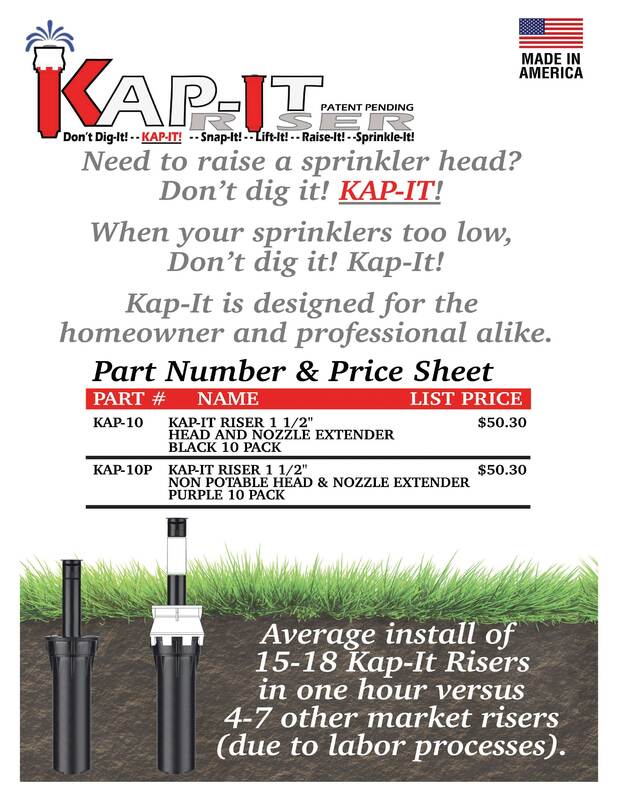 The Kap-It riser allows you to raise a sprinkler Quickly! Easily! And with NO DIGGING! If your sprinklers aren’t too low now, they will be. Simply expose the top of the sprinkler head and unscrew the nozzle add the stem extender and snap on the new Top! After reattaching the nozzle and lining it up, you’re done. No tools No dirt in your lines and no stress on any of your below ground fittings. Kap-It fits on the most popular heads, and changes none of the original workings. When your sprinklers too low, Don’t dig it! Kap-IT! Oh, and they are STACKABLE for those extra deep heads. 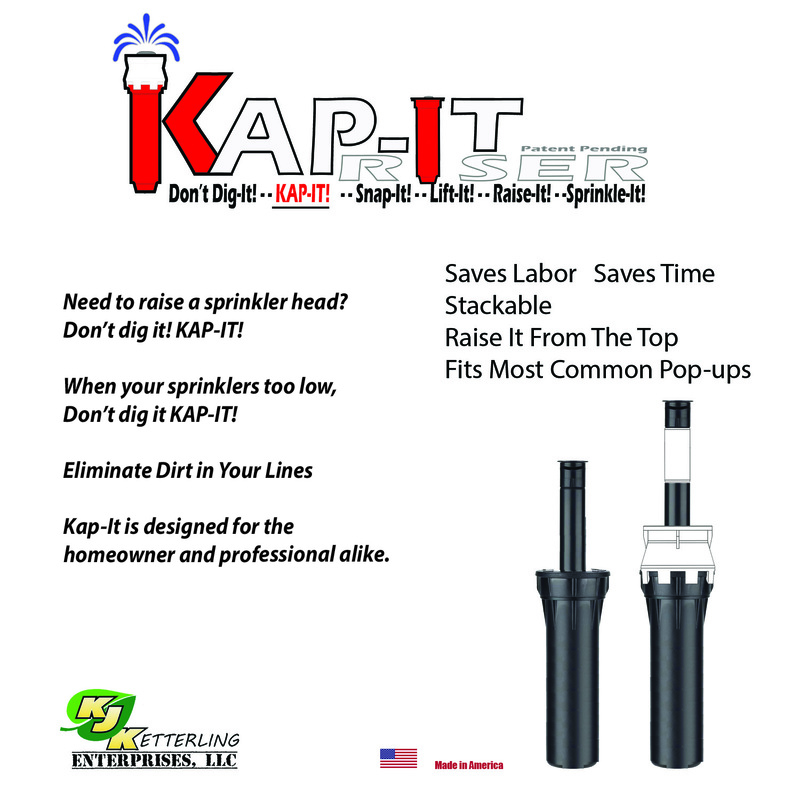 Kap-It allows anyone to raise a sprinkler head from the top instead of from the bottom! By extending the stem of a standard riser, you have raised the height. The new snap on top protects the stem extension, while leaving all of manufacturer’s original parts completely intact. Kap-It keeps the rocks and debris normally introduced into the head when a sprinkler is unscrewed below ground. The snap on top is designed to still allow regular access to the inside of the head itself, by maintaining the ability to unscrew the top of the canister with the Kap-It , even when more than one is stacked. Simple, Secure, Fast, and Permanent jump up your nozzle with a Kap-It. 3. How does your product improve water/resource use efficiency? When a sprinkler is not above the grass blade height, even the most advanced water saving nozzles distribute water inefficiently. Blockage of the water stream causes increased water waste and run off. As a standard cure to extend the life of risers that are too low, home owners start lowering the deck height of their mowers. This increases soil temperatures, increasing evaporation, and requiring extended water run times. There by increasing water needs. By making it fast, and easy enough for anyone to raise their sprinkler heads, watering stays efficient, and distribution is maximized. Kap-It is designed for the homeowner and professional alike. The pro is able to quickly clean around the top of the sprinkler cap. Unscrew the nozzle add the stem extender. Slide the Cap Extender over the stem and snap it down onto the existing cap. Replace the nozzle and align. The only thing else to it, is you can add more than one, and use it to unscrew the canister cap. What is your product's life expectancy/warranty? Life expectancy of the Kap-It is equal to the head it is being attached to. Kap-It is made to take a beating, and because there is no changing in the original Head structure or workings, there is minimal possibility of failure. 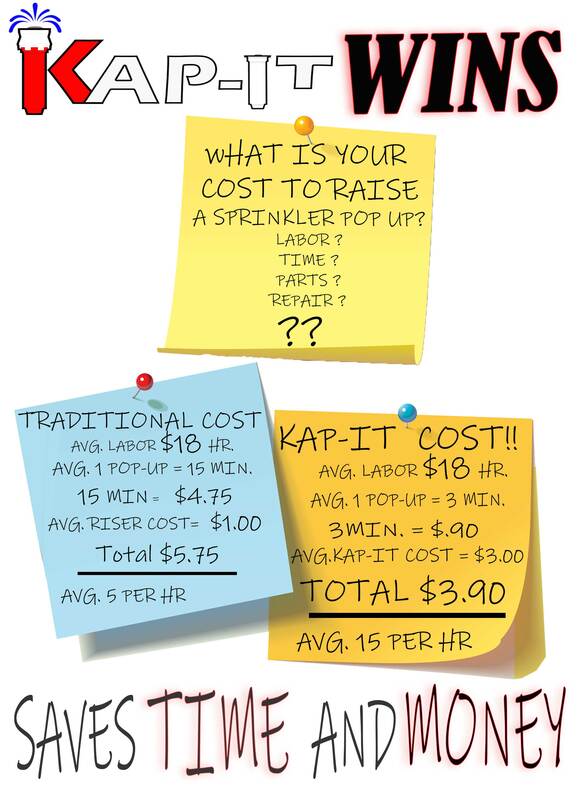 Kap-It has a One Year warranty against manufacturer defects.